I'm running a workshop on how to have ideas for making art. I am running a workshop at Frontyard in Marrickville in Sydney's inner west on Novemeber 26 from 1-4pm. Have you ever wanted to make some art but didn't know what to make? Have you sat in front of a blank piece of paper and not known where to start? Come to this workshop with and find out how you can use your creativity to access the ideas you have hiding inside you. Ideas for making art start as tiny notions, not fully fledged plans. At the workshop, we will go through the process detailed in the book I writing about having ideas for artmaking. You will leave the workshop with a small list of your own original ideas and an understanding of how to continue the process in the future. Each guest will receive a small notebook from Nick Lee. 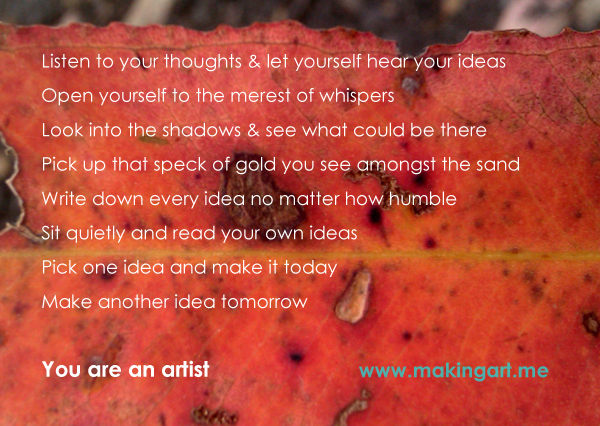 Helping you to visualize, work through, plan and ultimately manifest your ideas as artworks. The workshop is suitable for all mediums, and skill levels.